I clearly remember how HTC exploded off the blocks in the smartphone scene at one time, when it led a plethora of Android-powered smartphones that made it seem as though the company could do no wrong. However, something, somewhere along the way, things did not turn out as expected, as the smartphones churned out by HTC started to become mediocre and failed to excite the competition, and this was also when Samsung seized the initiative with their Galaxy S range. Still, it is nice to see HTC return from the tethering brink with the HTC One (M7), and that model was followed by an even greater success, the HTC One M8, and now we have the pinnacle of their achievement to date announced – the HTC One M9. 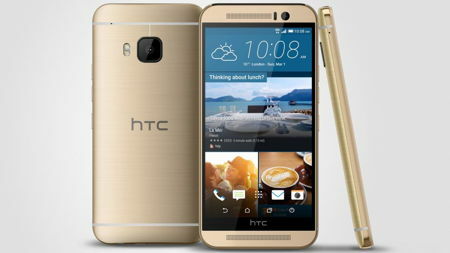 Bringing together a unique combination of elegance and performance, the HTC One M9 is touted to be the most personal, beautiful and powerful smartphone from HTC yet. Being a classic yet timeless celebration of beauty and elegance, it will merge high style and performance so that you can maximize your usage of the smartphone. While it boasts of distinct metal edges alongside graceful curves for a jewellery-grade look, it remains small enough and easy to hold, as the crafted, all-metal unibody design is highlighted by an exquisite dual-tone silver and rose gold finish. Throw in the new HTC Sense 7 experience, and you have got form and function working hand in hand. HTC Sense 7 reinvents the home screen so that you always have quick access to the most useful and relevant apps on the homepage based on your location. The improved HTC BlinkFeed also intends to make it easier to uncover the hidden gems which are around you through location data based on recommended points of interest, news and information. The HTC One M9’s cameras are no slouch either, ensuring that quality is always part of the deal. The main camera at the back boasts of an incredible 20MP which accentuate every crisp, intricate detail and a sapphire cover lens that delivers protection from scratches. If you would like to capture vivid video, fret not, the HTC One M9 does that as well in 4K resolution. Low-light shots can also be achieved thanks to the powerful UltraPixel front-facing camera, where dynamic auto exposure and UltraPixels will be able to capture 300% more light than standard cameras. The inclusion of HTC BoomSound makes the experience all the sweeter as it delivers 5.1 channel Dolby Surround sound simulation. Pricing details remain to be known, but the HTC One M9 will be available Stateside via AT&T, Sprint, T-Mobile and Verizon early this spring.